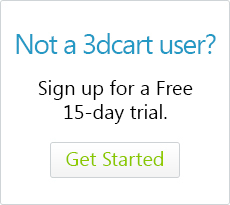 Your 3dcart store's templates are 100% customizable, which allows you to have a great amount of creative control over how to edit your site's look and feel. Although a strong working knowledge of HTML coding is favorable for advanced modifications, there are some options which might come in handy for less experienced users. This article will detail some of the editing options available to you in order: from easy to more advanced. Wherever possible, we've made access to the WYSIWYG ("What you see is what you get") available in various sections of the cart. WYSIWYG (Pronounced wizzy-wig), and is an editing tool which allows you to enter formatted text and basic HTML coding onto your pages without having direct knowledge of HTML. It consists of a web-based editor that allows you to input text in an environment, very similar to a word processing program. Go to Settings ->Design ->Store Status to edit the page that is seen when the store or checkout pages are closed from the public. Another resource at your disposal is the Store Language section. This area of the cart allows you to control many of the labels and syntax that is used throughout the whole site. For example, the path to the default "Free Shipping" icon that is displayed on your free shipping items can be edited and even removed from your store directly from the Store Language section. To get to the Store Language page go to Settings ->Design ->Store Language and have a look at some of the options available to your there. Many users will be surprised at just how much information is contained in the Store Language section. In fact, before attempting to edit any of the templates, you should always check the Store Language section first. Along a similar vein as Store Language; the System Messages page will allow you to edit some of the various error and system wide messages that appear to your shoppers during specific situations. So if you are not comfortable or knowledgeable with HTML coding, then perhaps some of the above options will be better suited to your needs. And even for more experienced users, a good rule of thumb is to always check what's possible through these methods first before you consider making edits to the site's HTML templates. However, if the changes you desire cannot be made using these methods, be aware that the HTML templates are still available to you. Just be sure to make the proper backups of your files to be on the safe side. Also, don't forget that 3dcart has an extremely talented in-house design staff available to help you realize your design needs!